This year we have combined the November and December issues into a single holiday issue which we hope you will enjoy reading. Starting things off is the second installment of Jami Mills’ short story, Wishbone One, which explores universes without and within. Vigorous training is underway for a controversial manned trip to Mars, but there are many challenges in such a mission in the best of circumstances. Klannex Northmead introduces himself to our readers with his poem, Buddha. We couldn’t be happier to include his wonderful work in this issue. Art Blue is certainly alive and well in some realm. How do we know this? Because Parallel Lives: A Step Into the Future didn’t write itself (although Art’s AI, Neruval the owl, may be playing us all). As a companion piece, Herbert W. Franke’s German story, Der Traum vom Meer (Ocean Dream), translated for rez by Art Blue and Jami Mills, is a wonderful cautionary tale about the future. Stalking the Aisles of the Supermarket is another wonderful poem by Mariner Trilling, who can resist everything but temptation. Jullianna Juliesse contributes her poem, Waltzing Toward Armageddon, which is an honest, eyes-wide-open look at our world. The Perfect Gentleman, Harry Bailey, is back and has discovered a charming group of ladies called The Iron Roses, a pitch-perfect, ribald burlesque troupe whose main aim is to titillate and entertain, and they hit a bulls-eye on both counts. Will Blake is back with his unique poetic voice, this time bringing us Destry Nurses a Broken Heart, describing the Wild West as never before. And bringing this holiday issue to a close is Kamille Kamala, whose tender poem, The Damask Rose, is a fitting conclusion, tying the thorns and blossoms of this issue together so very nicely. Enjoy this issue and, above all else, enjoy your friends and family this holiday season. We’ll see you again in 2016. It's hard to believe that 14 years have elapsed since that inconceivable day when so much was lost. You'll find in this issue a number of allusions to 9/11 and those affected by it, because it is so much a part of our collective consciousness. We mourn those we've lost and we continue to bond together. Art Blue (who, like Francisco Franco, is still dead) contributes what might be his most brilliant article yet (Parallel Lives - The Glory of Past Times) - - you decide - - but this is Art's voice as we've not heard it before. Death (okay, cryogenic suspension) becomes him, I think. Jolie Carter, new to our pages, brings us a succinct poem, Moment, which makes us consider each capsule of time. Simonetta Martella is another new poet (we are blessed with a waterfall of wonderful poets thanks to Jullianna Juliesse) who takes us back to that New York state of mind. And then to Cassie Parker, who with her sheer will, has taken TerpsiCorps ARTWerks from a fleeting idea to actual production. She walks the walk. Chrissy Rhiano, Art Director and lead dancer (well, let's just say, the "driving force") of TCA, together with a Who's Who of dancers in the dance world, brings us Requiem, a tribute in dance to everyone affected by 9/11. There will be one performance of this sensitive and graceful production. I hope you can say you were there. Jullianna Juliesse reflects on that fateful day with her exquisite poem, What Color Was the Sky That Day. And if you want to luxuriate in words and images, enjoy Serene Bechir's in the pine straw blowing, which lulls us into a reverie. Gudrun Gausman, who has been on deep-cover assignment for several months, is back with an enlightening (and highly illegal) insight into North Korea and its mercurial Supreme Leader, Kim Jong-On. Believe me, only Gudrun could do reportage like this, and we're grateful she safely returned to us. Guilt Has No Room Here is Merope Madrigal's latest contribution. I can only hope his music graces our pages for months (years?) to come. What can I say about LunaAzulejo? Her A Fish Fable transports us to a simpler time, where silver fish spawned and everything made sense. Cajsa Lilliehook, from whom I hope you will be hearing more in future issues, explores hats in such a fascinating way. But not just any hats ... she makes the case for hats that make a statement - that elevate - that, well, just make us feel good. Special thanks to models Selene Snowpaw and Jewell Ember for making these hats look so damn good. Our rogue reporter, StarGazer Daylight, has discovered another up and coming model, Jaily Bailey. Enjoy Star's interview with Jaily, who enchants us with her beauty and her drive. Who else would you trust wrapping up the issue than Mariner Trilling, who somehow has a way of tying everything up with a beautiful ribbon. Enjoy his poem, So Long and Good Night, which closes our issue, which we hope so much that you enjoy. This is a particularly exciting issue of rez because Jami Mills delivers this month's cover story about one of the most innovative and entertaining shows that we've seen in a long, long time. I refer to the Disney cavalcade, Imagine! This show, which just enjoyed its final performance a week ago, was produced by ExtravaDanza, The Elyzium Cabaret, and The Night Theater. Master sim builder, Royal Swippe, delivers outstanding builds, and the dancers, choreographers, and other entertainers treat a magic carpet riding audience to a great show. For those of you who think that Art Blue is dead, well...you're right. He is. But that doesn't mean he's lost the ability to communicate with us from whatever dimension what's left of his brain inhabits. Parallel Lives is Art's offering this month, speaking to us from God knows where. He is no less fascinating dead than he was alive - - our most provocative voice from beyond the grave. Jullianna Juliesse, who has returned to rez from her too-lengthy sabbatical, has encouraged professional writer, Mariner Trilling, to contribute a powerful poem, Hunger, which appears opposite one of Julie's sensuous poems, Sunday at the Met, and it's hard to imagine a most incendiary combination. Cassie Parker continues to provide unique insights (as a professional theater producer in RL) into her process of developing and nurturing talent in her piece,On the Nature of Nurture. In it, she gives more details about her new virtual company, TerpsiCorps Artwerks, which will launch its first show early next month. We wish her great success, but with her formula, we think it's a foregone conclusion. Cute chronicles Hitomi Tamatzui's introduction into the world of virtual babies, from birth and beyond. Raising a virtual family has come a long way over the years, and it's quite the challenge, even without the smelly diapers. To Kazantzakis is a thoughtful poem by newcomer (torez) poet, Mario Zecca, who conjures up sumptuous images of ancient Crete. We hope to hear his engaging voice again in future issues. Merope Madrigal is another poet who is new to our pages, and she introduces herself to our readers with a wonderful, evocative poem, Nine Pianos, in this month's issue. We hope to hear her playing again, too. The Perfect Gentleman, Harry Bailey, recounts his recent woes of being Homeless in Second Life, following his banishment (he did nothing to be ashamed of) from his home and put out like last week's trash. Basking in a seaside hammock, he doesn't seem to have it too bad. 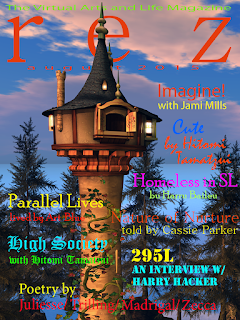 295L To Get Your Privacy is a Q&A with our publisher, Jami Mills, and Harry Hacker, whom you will remember from Sedona Mills' noir serial that appeared earlier this year. It seems Harry can speak from the great beyond as well. More cyber mystery comes from his lips. Hitomi Tamatzui covers the social event of the horse racing season with her piece, High Society Horse Racing, which closes the August issue. She covers the 125,000L prize winning horse, as well as the toney social scene that is horse racing society. All in all, a very strong and hopefully entertaining issue for your reading pleasure. We hope you enjoy it. This month’s issue is a watershed event, as it marks the last offering (CODE64 in Space) of Art Blue, learned futurist, virtual art archivist, and accomplished performance artist in his own right. His groundbreaking installment at LEA14, Moonrezzer, which has been featured in prior issues of rez, ended its run on June 29th. Art felt it was only fitting for him to end his run as well on that sad day. He did not want to call attention to himself, but neither did he want to linger after his opus work closed, preferring instead to “go out on top.” Luminaries of the virtual art world bid him adieu and all that is now left of Art Blue is what is contained in all of Art’s code that Neruval (his AI owl) has scrupulously preserved. There will never be another Art Blue. We can only hope that some of his insightful talent survives in one form or another. (Neruval, of course, knows more than he’s letting on.) We are very fortunate to be able to introduce our readers to a new luminary of the written word, LunaAzulejo, whose tone poem, Salt Song, is achingly beautiful. We’re hopeful that her story continues, as we’re certainly left wanting more from this phenomenal writer. In her fascinating piece, The Byway Nigh Me, Cassie Parker pulls the curtain back on her process as she takes us behind the scenes into the first meeting of the Board of Trustees of her exciting new arts production company, TerpsiCorps ARTWerks. As with everything that Cassie touches in both her worlds, she unapologetically insists on a commitment to excellence. Her now-forming troupe intends to launch its first performance in September. For those readers who have ever pondered what the Gor experience is all about, you’ll never read a more insightful description than in this month’s piece by zari, The Heart of a Gorean Slave. Bright, witty, articulate – zari helps us understand how she reconciles her own belief in the importance of empowering women with her personal yearnings to be a slave girl, subjugated by a male-dominated society. And after a hiatus, Jullianna Juliesse returns to rez with a wonderful poem, Your Sybarite. We couldn’t be happier that Julie is back, and I’m not the only one who is looking forward to some wonderful pieces from her in the future. Building a Show is Hitomi Tamatzui’s in-depth examination of dance in the virtual world, from staging to choreography and everything in between. Hitomi brings together dancers, designers and choreographers in a round table discussion of the challenges and joys of putting on a professional quality dance performance. All in all, assembling this issue was both poignant and thrilling. I hope you enjoy it. Some people really don’t need any introduction, even though they are new to us. Cassie Parker is one such person. A huge talent in both worlds, Cassie brings a perspective on the performing arts that few possess. Cassie produces world-class theatrical productions in real life, which makes us immensely proud to have her join our staff at rez. 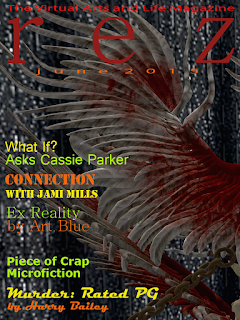 Not only will you enjoy her second piece for rez, What If?, but you’ll enjoy many future articles as well. Cassie asks some very important questions about what makes a virtual production special. All wonderful food for thought. Welcome to the asylum, Cassie. Speaking of needing no introduction, Art Blue is back with a thought provoking piece (when is Art never thought provoking? ), Ex Reality. Futurist, mad scientist, bon vivant, Art sheds light on places and times we never knew existed. But he always manages to bring them into clear focus. Coming off the success of the LEA performance art piece, Moonrezzer, which people are still talking about, Art can’t sit still. Whether his AI, Neruval the owl, is really behind Art’s burst of creativity, we may never know. For those of you who have ever thought about your family history, great-great grandparents, and cousins once removed, genealogy is the subject of Jami Mills’ article, Connection. Genie Wezzles and Barbara Collazo met with Jami recently and discussed family trees and all of the digital tools that are now available to make a search of family histories so easy, any one of us might be tempted to start a search. Who knows? Maybe we’ll all find out we’re related to Charlemagne. Save June 6 for a gigantic SL/RL family reunion at the SL sim, Just Genealogy, to celebrate our inter-connectedness. And this month, The Perfect Gentleman (aka Harry Bailey) brings his noir crime spoof, Murder: Rated PG, to an unexpected close. Did Sed do it? Will justice be done? Will Harry get paid? And one last thing: our monthly piece of Crap. This month’s microfiction blast is Mouse, which proves that technology isn’t always used for Good. Does Crap have a dark side? Read on. Harry Bailey (aka The Perfect Gentleman) has always had a weakness for a nice pair of legs. This month he revisits his past in the first of a two-part SL spoof on the 30s crime noir genre, tackling a murder most foul in Murder: Rated PG. Believe me, you'll never look at the 4" heels on a pair of Bax boots quite the same again. With his Girl Friday, Friday Blaisdale, keeping Harry centered (how she endures the smoke from Harry's Havanas, I'll never know), they're on the case. It won't be solved until next month's issue, but this is an exciting first chapter. Speaking of excitement, Art Blue will be opening his long-awaited art project at LEA14 this month called Moonrezzer. It's safe to say there's never been anything remotely like Moonrezzer before, nor will there be in the future (and Art knows a thing or two about the future). As an added bonus, Art opens reveals a "big lie" popularized on The Simpsons. We're used to Hitomi Tamatzui finding one SL gem after another, and this month is no exception. Hitomi chats with two of the brightest stars in the SL art metaverse, Misprint Thursday and Gracie Kendal, who also have exhibits at LEA this month. LEA, it seems, has definitely stepped up its game. And we know about Hitomi's photographic prowess from prior months. This time, she really brings these dazzling artists' works alive. Our newest addition to the rez writing staff, Cassie Parker, asks probing questions about the performing arts in both RL and SL, having been captivated by the dance productions of Chrissy Rhiano. We look forward to many, many articles on the arts (as well as some short stories if we get lucky). Crap Mariner reveals another of his fetishes (of which there are many) this month in his 100-word piece of microfiction, Kissing Booth. And bringing the issue to a close is one of our very favorite poets, Zymony Guyot, who shares with us his passion for Picasso in his stellar work, Picasso in the Cloudy Afternoon. 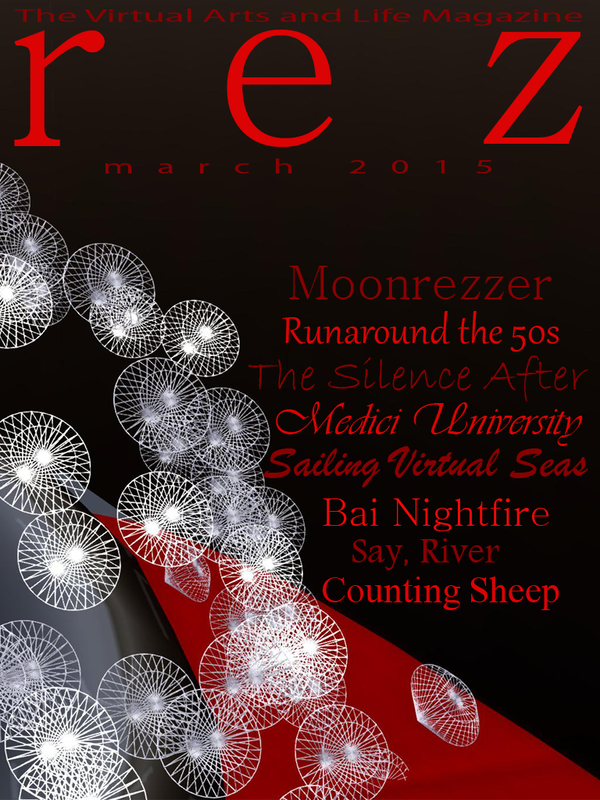 Welcome to the spring issue of rez Magazine, wherein we introduce the second installment of Art Blue's The Moonrezzer: The Springfield Bet on the Moon. Art makes a wager that he already knows he's going to win. How? Because he knows more about one thing than anyone else: the Future. And joining Art this month for the first time is his AI, the wise owl with bookish good looks, Neruval, who chimes in with an observation about computers and their capabilities and their souls in Cloudrezzer. Crap Mariner is troubled about something this month: cat hair on his favorite shirt. Find out what he proposes to do about it. This month, Jami Mills examines just how Relay For Life operates here in the virtual world, and elsewhere. Much to her surprise, she finds that avatars are generous givers to charity, especially one so worthwhile as The American Cancer Society. Jami focuses on one particular team, CDS Hooters Philanthropic Society, who, together with all the other virtual teams over the years, has raised over $2,000,000 (US Dollars, not lindens) for a very deserving cause, the battle against cancer. Emily Hamelin has kept us on the edge of our seats for several months now. She gets inside the mind of a cunning, beautiful, and introspective assassin, going about her business. This, the third and final episode, throws us a curve we weren't expecting, leaving us breathless. Hitomi Tamatzui takes her camera in tow and actually enters an exciting virtual photography competition, PhotoHunt, where photographers of all stripes congregate and have one hour to submit a photo (no PhotoShopping or even cropping). As only she can do, she takes us along for a typical evening's fun, and we're glad she did. Elysienne returns to our pages with a heartfelt and passionate Quebeckers, a recitation of the joy and conflict of being a Quebecker with deep Cree roots. Elysienne speaks honesty and directly from the heart. Her piece is still with me to this day. Thank you for taking a peek. Art Blue brings us the feature story this month in his most ambitious effort to help us all understand the one thing we've never before experienced: the Future. Call him a futurologist, computer historian, patron of the arts, Art Blue has a passion for virtual worlds and the creative forces that drive them. Not content to protect the virtual art of the best creators on the grid, Art now ventures forth with his own exhibition, Moonrezzer, sponsored by Linden Endowment for the Arts. I assure you, nothing I can say can prepare you for Moonrezzer. You simply need to see it for yourself. Stargazer Daylight has struck gold again in the fashion world, this time capturing a few moments with Bai Nightfire, a model relatively new to the virtual modeling scene, but who has certainly found her calling. Stargazer has a way of bringing out the best in her interviews, and her chat with Bai Nightfire is another example of her fine work. We include a poem by Will Blake, Say, River, probably one of the finest voices in any world, in any medium. Let Blake's words flow over you, and don't be surprised if they're still there tomorrow. Emily Hamelin has written a trilogy called The Silence After, and her second installment appears in this month's issue. Emily writes with a smart, easy-flowing style that particularly suits this story of a female assassin with a brain to match her seductive charms. Sailing the Virtual Seas is this month's contribution by Hitomi Tamatzui, who not only finds the most fascinating locales to write about, but she accompanies them with her dazzling photography, making us always look forward to her next adventures. Myra Wildmist comes back to rez this month with an eye-opening look at the Medici University, an artist colony immersed in a postmodern environment. Myra's images and descriptions of the history and mission statement of Medici University certainly make us want to go back to school, this time willingly. Harry Bailey (aka The Perfect Gentleman) goes back to his strength: music from yesteryear. Who would you rather explore the 50s sim, Runaround Sue's, with than one of the most knowledgeable people of that era. And how much fun is it to see all the poodle skirts dancing to Buddy Holly? And to bring this month's issue to a close, Crap Mariner had trouble sleeping. And when that happens, you can be assured that someone is going to pay. 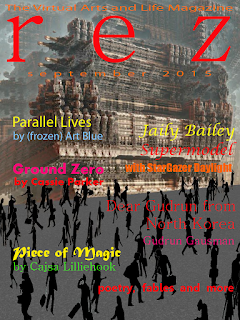 Please enjoy this month's issue. 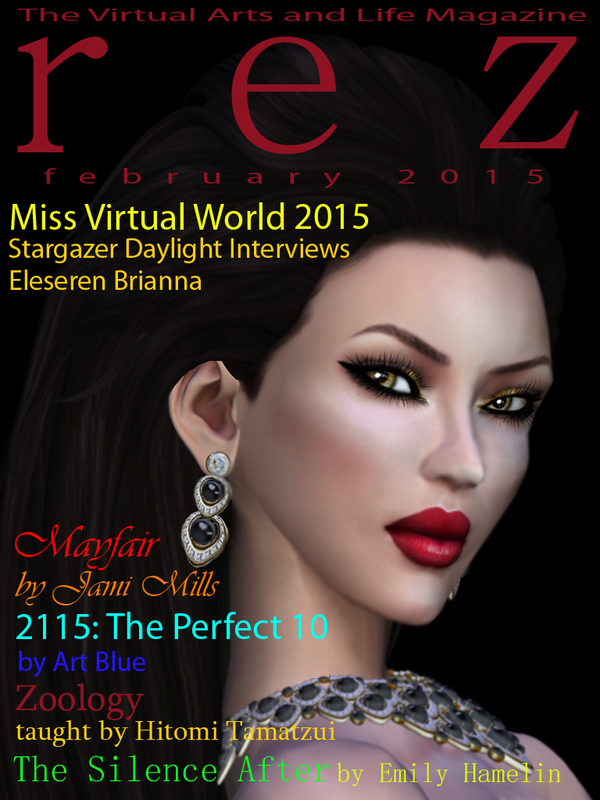 This month, our fashion correspondent, Stargazer Daylight, scores an interview with the busiest model in the metaverse, Eleseren Brianna, who was just crowned Miss Virtual World 2015, one of the most prestigious modeling competitions around. And you will be heartened to discover in the course of this far-ranging interview that Eles isn't letting her celebrity status go to her head. Far from it. This fascinating lady give us refreshingly unpretentious insights into modeling in the virtual world. Next, Jami Mills tells us in pictures about Mayfair, Idle Rogue's latest production of the Anne Rice tale of witchcraft. Mayfair had a short one-week run at the end of January to sold out houses. Chryblnd Scribe produced and directed a large and extremely talented troupe of actors, dancers, animators, scripters and set builders in this one of a kind production. This show follows up on the success of Le Cirque de Nuit and establishes Idle Rogue as one of the leading dramatic ensembles in the virtual world. Our own Art Blue peers 100 years into the future with 2115: The Perfect 10 in Elysion, perhaps his finest piece yet. It is nothing short of miraculous how he time travels with such ease, but I'm sure his AI owl, Neruval, has something to do with it. What a man will put himself through for The Perfect 10. First time contributor Emily Hamelin brings us the first of three installments of The Silence After, a thriller that explores a cold-blooded seductress/assassin who contemplates her first kill. Hitomi Tamatzui, who has shared with our readers so many of her wonderful photos and seems to always find something captivating, focuses this month on zoos in the virtual world, mixing in some interesting facts about wildlife and protecting their habitat. And no issue would be complete without some microfiction from our maniac in residence, Crap Mariner, who has 100 words of caution about strong, unpredictable weather events in his story, Stormy. We hope you enjoy this issue as much as we enjoyed putting it together for you. This month, Crap Mariner starts us off with his 100 words on awareness ribbons for a variety of worthwhile causes. No surprise, Mariner latches onto one he might wished he hadn't. We've included in this issue (and will continue to do so in each monthly issue in 2015) a tribute to Bryn Oh's 2015 Immersive Art Calendar, the real life project of virtual art archivist (and regular rez contributor), Art Blue. Each month we will feature a month from Bryn's calendar, which was designed and created by Jami Mills and Ziki Questi and printed in the real world by Art's non-profit art trust. Each calendar month features a shot from one of Bryn's varied works. Jami will also share a few of her thoughts each month about Bryn's work. 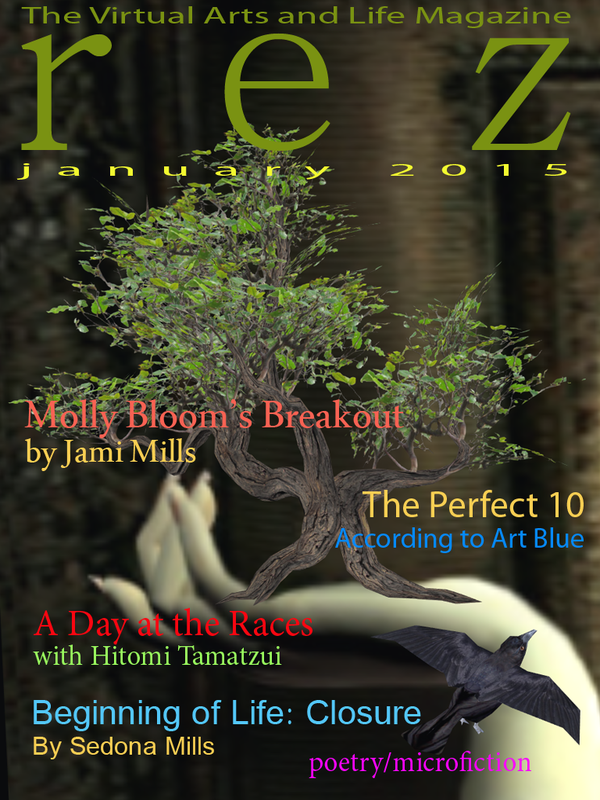 In this month's issue, we bring you January: The Singularity of Kumiko. Molly Bloom is the focus of our feature article this month, also gracing our cover with a close-up shot of her amazing work, Back to the Garden, one of a surprisingly eclectic range of new pieces now appearing at The Rose Galleries. What is exceptional about her show, Depth Perception, is Molly's "breakout" from the confines of two-dimensional art, bringing her subjects right into the exhibition space itself. Molly's keen eye for classic themes, whimsy and satire are on full display in this one of a kind exhibition. In the finale of her masterful futuristic cyber-thriller, The Beginning of Life: Closure, Sedona Mills draws this action-packed serial to an exciting conclusion. Sedona gives has given us quite a bit to consider about how computers and humans will interface in the not too distant future. She's definitely left us wanting more and we hope that will be forthcoming in the months ahead. Hitomi Tamatzui continues to capture images from some of the most exotic places in the metaverse, this time with A Day at the Races, where she does an in-depth study of virtual horse rearing and racing. Hitomi brings her usual photographic skills to bear with some dazzling images of thoroughbred racing at its most exciting, and includes along the way some fascinating background information from horse breeders too. No issue would be complete without the latest musings of Art Blue. This time we hear about his longing for the perfect woman. The trouble is, it's 100 year in the future. 2115: The Perfect 10 in Elysion is the first of a two-part series where Art comes back to present day to tell his tale and engage our readers with his thought-provoking ideas about the cyber future. And finishing this month's issue is another gut-wrenching anti-war poem from Zymony Guyot called Fabulous Monsters. Zymony's dark, weighty themes don't depress us, they uplift us, by reminding us of what humanity should be all about. 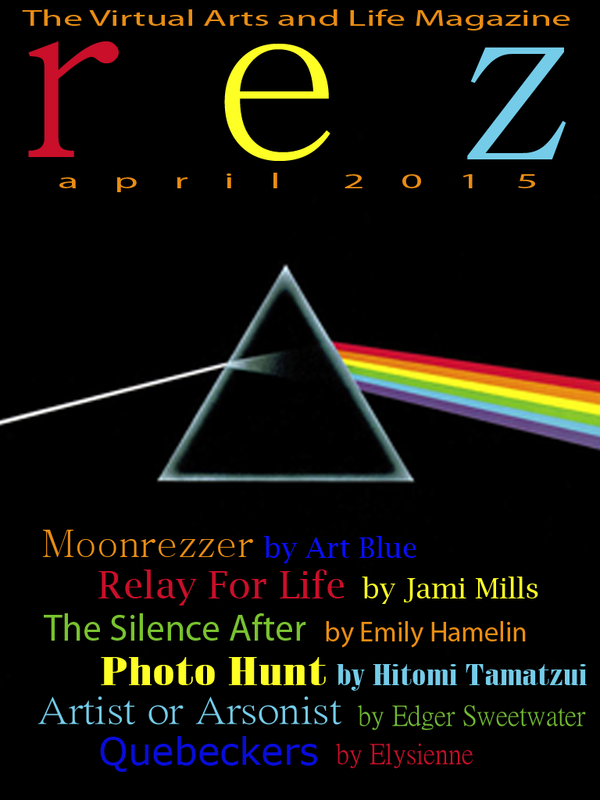 Please enjoy this month's issue of rez.